A world leader in unique technologies and dispersed catalyst for heavy oil upgrading. 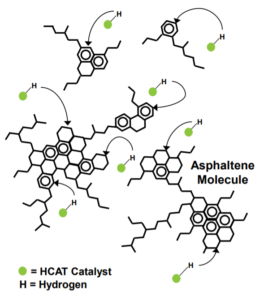 The HCAT Hydrocracking Catalyst is a single-molecule catalytic agent, chemically generated within the reactor system from a proprietary liquid catalyst precursor, introduced with the residual oil feedstock. The HCAT Technology consists in the HCAT Hydrocracking catalyst and the mixing system. By reducing the catalyst to the size of a single molecule, the reaction system can be optimized for desired reaction. This dispersed catalyst facilitates hydrogen transfer, particularly into large asphaltene molecules that cannot readily access the active sites of the solid supported catalysts in ebullated beds. 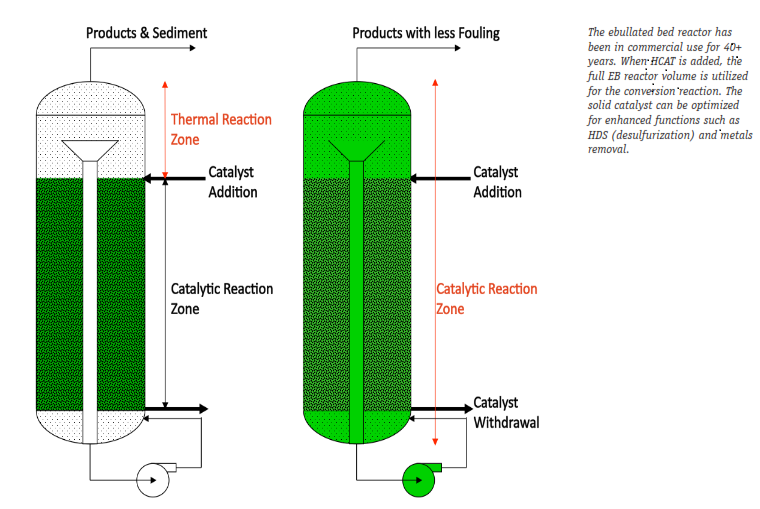 Hence, HCAT Catalyst compliments the solid supported catalysts and allows the ebullated-bed reactor system to operate more efficiently. With its ability to handle a wide range of feedstocks with different properties, maximizing syncrude yields while minimizing coke and asphaltenic byproduct formation, HCAT is ideally suited for upgrading projects using heavier, less-costly feedstocks, such as those found in Russia, Mexico and Canada.